Hangzhou Private Tour Studio is prepared for those who are not ready or not want to travel with other tourist tour. You and your party (maybe your lover or your family or friends) enjoy the exclusive use of a private car or a private van with a private local tour guide and private chauffeur. . If you have any special requests, please let us know, we are able to tailor a private tour for you . On arrival, our guide will hold a welcome sign to meet you at airport or train station and transfer to the hotel. Stay at the holliday inn express ,or same lever. one of the most noted architectural symbols of Shanghai. The word "Bund" derives from an Anglo-Indian word for an embankment along a muddy waterfront. Move on to Shanghai Bazaar. i It is located in the heart of Shanghai’s Old City (Shanghai bazaar), one of the few existant old tourist places in Shanghai. Shanghai bazaar is teemed with a great number of small streets and lanes where vendors sell their products and food stuffs to the tourists and local people. After lunch,go to the Nanjing Pedestrian Road. It is regarded as the first commercial street in Shanghai. It was first built in 1851. Now Nanjing Road has turned into the number one site for shopping in the city. The large traditional stores no longer dominate the market since modern shopping malls, specialty stores, theaters, and international hotels have mushroomed on both sides of the street. continue to visit the new development zone in Pudong - Lujiazui, which is teemed with the futuristic, avant-garde buildings - Oriental Pearl Tower,. Taking the elevator to the upper spere of Oriental Pearl Tower to have a bird’s eye view of Huangpu River. Morning Breakfast at hotelMeet your guide and driver at your hotel in the morningdrive to zhujiajiao water village .it is famous for the well preserved ancient residential houses, the elegant watery views and the strong local colored traditions and customs. It has been called the "Venice of the East". 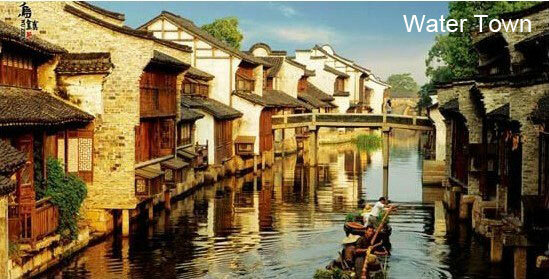 Drive to Suzhou and check in at your hotel in Suzhou. The city is often referred to as "The Venice of the Earth." Its famous private gardens are listed as World Culture Heritage. First visit Net Master Garden, the best and most celebrated as a model Ming Dynasty Garden in all of Suzhou. Then move on to the Ancient City Gate and Grand Canal. The Panmen City Gate is the oldest city gate in existence in Suzhou city. It used to be one of the eight city gates during the Spring & Autumn Annals (770-476 BC) when Suzhou was the capital of the Wu Kindom. The Gand Canal is one of the greatest ancient projects in China and is the longest man-made canal in world. 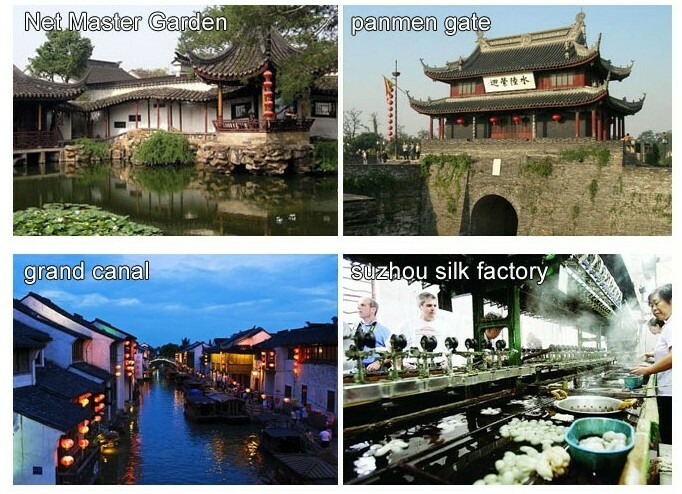 then have a short tour of a silk spinning factory to see how Chinese silk has been produced since the 14th century. After breakfast you will depart for a city tour taking in the beauty of the West Lake, huagang park, a Tea Plantation and the hefang street. all fees included and there is no hidden/extra surcharge! 1.All entrance fees listed in itinerary. 5. Tips or gratitude to guides or drivers. 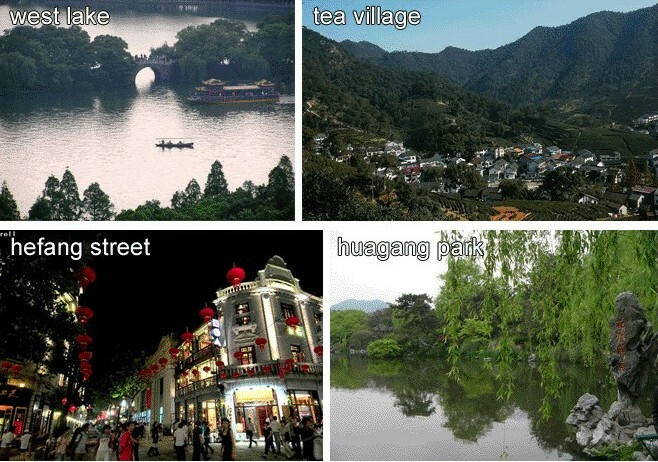 East China is a top tourist destination of China, and the most developed part of mainland China as well. 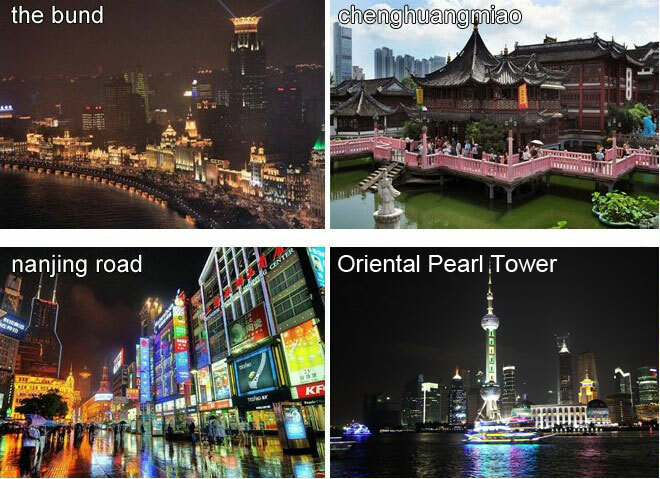 It centers on Shanghai, Hangzhou, Suzhou, Nanjing and Huangshan. The most vivid highlights of this region are the traditional elite’s culture and history, gentleman’s lifestyle, aristocrat’s paradise, Chinese multicultural center, the cradle and base of Chinese people’s sense of democracy, equality and human rights. Nowadays, it is also the biggest showcase of Chinese achievements in globalization. quick reply in 1 hour! We thank you for your interest in our travel service. For a fast response, submit this basic Quick Reservation or Enquiry form below by clicking "Submit", and we'll get back to you by e-mail within 12 to 24 hours. For urgent booking,, After office hours, please call +86 13567161784（English）.